According to a recent ReelChicago article, a 16-foot tall digital John Deere 8R Series tractor introduction impressed attendees at this year’s Agritechnica Exhibition in Hanover, Germany, as they learned more about new additions to Deere’s 8R family. 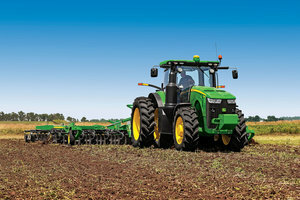 The digital experience, created by Next/Now, aimed to show the updated 8R Series tractor and its features in a way that garnered excitement and buzz. Next/Now utilized dynamic pixel-mapping projected on a pure white 8R tractor and added a 12x24-ft. partial-cube background which helped the complex 3-D application to move the tractor through a number of different environments, graphic animations, and special effects. The new 8R/RT tractor models were first introduced at the 2014 John Deere Product Introduction and are said to integrate the latest technology to provide the utmost in power, comfort and performance for row-crop tractors in this class. A 2-minute video clip of the exciting introduction can be found here. This innovative, audience-friendly introduction at the Agritechnica Exhibition wowed audiences while providing attendees with key product messages pertaining to the updated John Deere 8R Series.